Young Professionals in St. Mary’s County and surrounding areas are invited to spend a Night at the Museum — or actually just an evening. With support from The Patuxent Partnership, Southern Maryland young professionals will bring the Calvert Marine Museum to life after hours, from 5:30 to 7 pm Wednesday, Feb. 21, 2018. 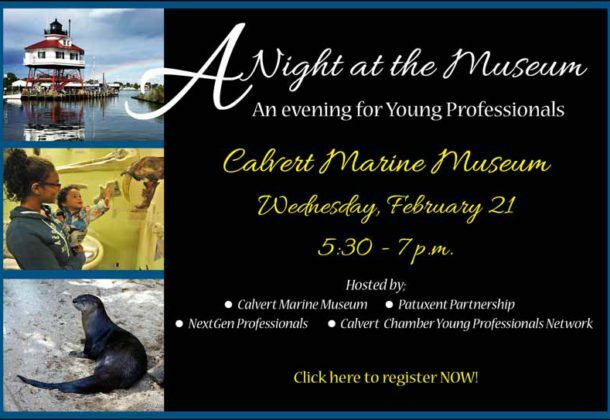 Young professionals will spend an evening of meeting and greeting, discovery and exploration at the event, which is hosted not only by the Calvert Marine Museum and The Patuxent Partnership, but also NextGen Professionals and Calvert Chamber Young Professionals Network. Participants will enjoy food and drink, fabulous door prizes, a scavenger hunt, and a special presentation from the Calvert Library on the critical importance of reading to children as libraries prepare for Read Across America in March. Professionals are invited to come as they are after work. The event is free to attend, but advanced registration is appreciated. For more information about this event, visit The Patuxent Partnership’s website. Join The Patuxent Partnership on March 21, 2018, for a program “Is Autonomy the New Cyber?” Three separate panels will offer expert advice on whether autonomous programs will be replacing cyber as the newest innovation in technology and defense. The event, which will be held at the Southern Maryland Higher Education Center, will start at 8 am with a welcome by Bonnie Green, executive director of The Patuxent Partnership. Opening remarks will begin at 8:05 am by Rear Admiral Mark Darrah. The first panel will begin at 9 am, with the title “Strategic Navy/Marine Autonomous Capabilities.” A speaker will educate the audience at 11, going into lunch time, which begins at 11:45 am. The speaker has not yet been announced. At 12:45 pm, the second panel will begin, titled “Leveraging Autonomous Capabilities for Warfighter Combat Superiority.” A coffee break and chance to see exhibits will be held from 2 to 2:30 pm. At 2:30 pm, the third panel will begin, titled “Advancing Autonomy in the Cyber/AI Domains.” A presentation is set for 3:45 pm, focusing less on national defense and more on American life. The presentation is titled “The Critical Role of Autonomous Vehicles in Disaster Relief and Improving Our Way of Life.” Closing remarks begin at 4:15 pm, and then a reception will be held from 4:45 to 5:45 pm. Sponsorship opportunities are available. Admission to the event is $50. For information, call Jen Brown, programs and membership director, at 240-317-6018, or by email at jennifer.brown@paxpartnership.org.